Compiled by local residents and produced by the GroundWorks Learning Centre for the PATH (Promoting Action Toward Health) project using icons from the international Green Map System. This map highlights valued assets in three communities in the Hillside Quadra area of Victoria and Saanich. These assets are broken down under four categories - Greenspaces and Recreation, Cultural and Heritage Sites, Organizations and Community Services, and Health and Wellness Resources - and are based on the everyday use and views of many local residents. * It is by no means exhaustive as there is a rich and diverse array of sites and services in this area. PATH plans to update the map in the future so if you would like to add or change sites contact PATH. 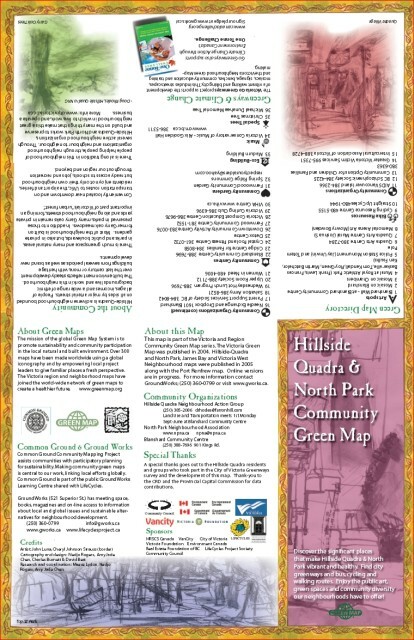 This project also includes a 40-map Hillside Quadra Community Health Atlas, available at PATH. 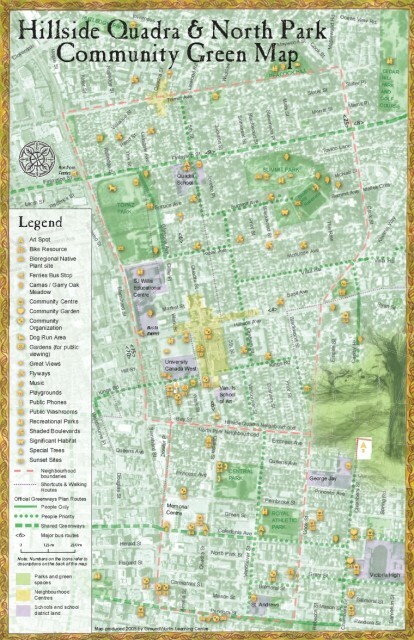 The Green Map icons used are part of the Green Map System used by over 150 cities and regions worldwide to document and encourage healthy, sustainable communities. * Blanshard Community Centre 901 Kings Rd. Map produced November, 2003 by GroundWorks - a project of LifeCycles. 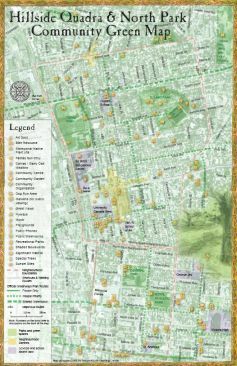 GroundWorks offers learning resources, community planning and mapping programs, and services to facilitate local and global sustainability and healthy community development. Map sponsored by Promoting Action Toward Health (PATH). PATH is located at the back entrance to Blanshard Community Centre, 901 Kings Road. For more information or to get involved, call 388-7696.